With the marvellous fiscal policies of the Labour Government, Australia took its budget surplus, and went south to what could reach the self imposed limit of its borrowings: $200 billion dollars. To the average person, this may not sound like a big deal...but for the true ramifications of this debt, read this shocking blog post. So with the country heavily in debt, the states have begun the battle to try and increase their income (revenue) by any means that the average Joe punter won't protest about (like increased income taxes). A favourite wolf in sheep's has been the use of speed cameras. You see speed cameras, or "safety cameras" as the PR spin likes to put on them, are sold to the public on the premise that they are there to increase safety, decrease fatalities, and of course reduce the carnage on our roads. Many police officers have also been brain washed into repeating this mantra in parrot fashion. They further justify their actions by saying things like "it's simple...don't speed and you won't get fined" or "it's a voluntary tax...you don't need to pay it if you don't speed"
The buses in NSW being clocked at speeds impossible to be reached at (that particular speed camera site) due to their speed limiters - as demonstrated on Today Tonight. The two ex-employees of the Victorian speed camera company that downlaoded the control software to their laptops that could potential control / reset / reprogram nearly all the cameras in Victoria.....the list goes on. No-one here at DelonixRadar condones speeding. We want to see MORE police on the streets that can target hoons, dangerous drivers, un-roadworthy cars etc - NOT automated speed cameras, but police of course cost money...money the governments just don't have. Speed cameras can write hundreds more tickets every hour than police officers can. With the massive debt Australia starts 2010 with, and the reduced funds going out to each state, low and behold, no surprises, Queensland, New South Wales, Victoria, and Western Australia announce plans to increase the number of speed cameras in use. Sold, of course, under the usual BS of road safety. 1) If the speed camera program is designed to reduce fatalities (by changing the habits of drivers, making them slow down) why does each budget forecast an INCREASE in the amount of fines revenue collected each year? Surely the end goal of a speed camera program would be to have ZERO fines right? That would denote a successful program. But it's the opposite. They forecast higher and higher revenue. This alone shows that the speed camera program is FAILING at what it's apparently supposed to do. 2) If the speed camera program was TRUELY about saving lives on our roads, why does only 1/3 or less of the collected revenue go back into road safety initives - fixing black spots etc and the rest goes into state coffers, used for any purpose? Instead of making dangerous roads safer, fixing black spots, erecting guard rails (all which COST money) - they can wack a speed camera up there and MAKE money instead! 3) Now this one should make West Aussies hopping mad....If the speed cameras are not about revenue raising then WHY IS THE GOVERNMENT LOOKING AT PRIVATISING THEM? Do you think the 'private' company will be happy if every year the reduction of incidents goes down and down, reducing their revenues. Of course not. They're here to make big bucks and the Government will go along with it as they will get a slice of the action with no effort expired. It will be a free for all, with cameras potted about everywhere they can scam a few dollars but none actually in the areas of high traffic accidents, or with hooning problems. By privatising the speed cameras in WA, the government is admitting point blank, that it's about money - not road safety. To add insult in injury it's a foreign (British) company that they are in negotiations with! So a large % of your money will be going offshore to foreign companies! It's time us Australians get off our lazy butts, stop being so compliant and just complain about the situation, and PROTEST this BS movement like the French do so well. Heck, even the Americans have banned speed cameras in many states. The best defence against a speed camera is not to speed. But that assumes three things. The speed limit is clearly indicated. Your car's speedometer is accurate. 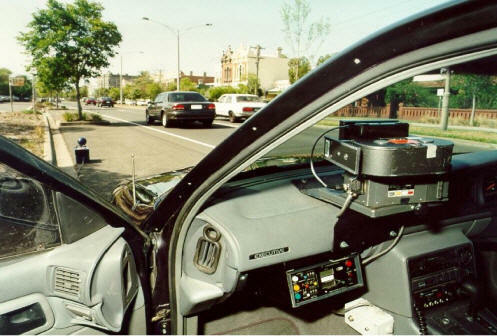 The radar, laser or speed camera that measures your speed was accurate. That the speed limit for the road at that point has been set at a level appropriate to the current condition of the road and surrounding environment.'' Setting a 60 kmh speed limit 20 metres along a well lit straight wide off ramp from a 110 kmh freeway is not a reasonable speed limit (which of course is exploited by the mobile speed cameras). For those still leaning towards the "don't speed and you won't have to pay" BS here's a collection of videos to show your blind sighted thinking. In 1996, the State of Montana reverted to the state speed limit policies that existed prior to 1974 and the National Maximum Speed Limit. The National Maximum Speed Limit was repealed in December of 1995. Montana returned to the use of Reasonable and Prudent speed limits on its federal and state highways. Reasonable and Prudent speed limits are not based on numerical maximums, but rather they require motorists to drive at speeds considered safe for prevailing conditions. Despite concerted efforts by the Montana State Patrol, Attorney General and Governor to replace the "reasonable and prudent" law with numerical speed limits, the state legislature refused to do so. The Montana State Patrol chose to enforce a de-facto threshold of an 80-90 mph limit for Reasonable and Prudent enforcement. During a challenge of such a ticket, in 1998, the Montana Supreme Court declared the Reasonable and Prudent Speed Limit unconstitutional, on the basis of vagueness. For the following five months Montana had no form of daytime speed limit on its rural highways. The following discussion is an analysis and comparison of Montana's experience with the Reasonable and Prudent speed limit, no speed limit in any form, and fixed numerical speed limits on two classifications of highway: 4 lane Interstate and rural federal-aid primary two lane highways. In 1999, after 4 years of no numerical or posted daytime speed limit on these classifications of highways, outside of urban areas, Montana recorded its lowest fatality rate. Research scientists and engineers have long known that there are sometimes unexpected results from changes in public policies. Ironically, the paradox of no posted speed limits and low fatalities is no surprise to the traffic safety engineering community. For years, motorists' advocates have used engineering-based facts against artificially low speed limits. They have claimed that by raising speed limits to reasonable levels, accident and fatality rates will actually be reduced. This seemingly wild assertion has been documented by the traffic engineering profession for 50 plus years. This fact-based position has again been proven to be true by the repeal of the National Speed Limit. The nation has recorded the lowest highway fatality rate since such records have been kept. What about the extreme of No Speed Limits on 4 lane Interstate and rural federal-aid primary two lane highways? These same fact-based engineers point to the German Autobahn, where, with no speed limits, authorities are consistently reporting lower fatality rates than comparable US highways. For the last 5 months of no daytime limits in Montana, the period after its Supreme Court had ruled that the Reasonable and Prudent law was unconstitutional, reported fatal accident rate declined to a record low. Fixed speed limits were reinstated on Memorial Day weekend 1999. Since then, fatal accidents have begun to rise again. This begs the question, do people change the way they drive when there is no speed limit? The evidence suggests the answer is yes. The measured vehicle speeds only changed a few miles per hour as predicted - comparable to data collected from other western states. What changed? The two most obvious changes were improved lane courtesy and increased seat belt use. Did other driving habits and patterns change as well? The lower-than-US fatality rates on the German Autobahn (where flow management is the primary safety strategy), and now Montana's experience, would indicate that using speed limits and speed enforcement as the cornerstone of US highway safety policy is a major mistake. It is time to accept the fact that increases in traffic speeds are the natural byproduct of advancing technology. People do, in fact, act in a reasonable and responsible manner without constant government intervention. The Montana experience solidifies the long held traffic engineering axioms, "people don't automatically drive faster when the speed limit is raised, speed limit signs will not automatically decrease accident rates nor increase safety, and highways with posted speed limits are not necessarily safer than highways without posted limits. The study on the effects of no daytime speed limits in Montana is clear. Traffic safety, if anything, actually improved without posted limits or massive enforcement efforts. Highway safety wasn't compromised nor can the lowest fatality rates recorded in modern times be ignored. Something happened, it was positive, and it needs further research to analyze what worked and why. Given the number of inaccurate speed camera stories, EVEN RECENTLY , it's no wonder the motoring public are fed up with the revenue raising greed of the government, all disguised under a blanket of so-called road safety. You see, speed cameras rake in a lot more money than traffic police, and cost a whole lot less to operate. And did you know that most speed camera devices in operation in Australia DO NOT meet the Australian Measurements Standard! Photo radar, also known as speed cameras, represent a huge revenue opportunity for all governments around the world. They cost less money to operate than a police traffic patrol car with its petrol, wages and insurance, not to mention a well placed speed camera can generate far more revenue than a whole squad of police cars. If (mobile) speed cameras were really about safety then why are they usually hidden from view and strategically placed not at accident spots or school zones, but at the bottom of hills, on freeways or just after a lower speed change sign. If speed really is the major factor in road fatalities then wouldn't freeways have the most deaths? Shouldn't Germany have more road deaths on the unrestricted autobahns? Not surprisingly the answer to both these questions is NO. Why are Multanova speed cameras in WA or Gatso cameras in Queensland and Victoria set to such a small tolerance that people are getting fined traveling a mere 3km/h over the posted limit? 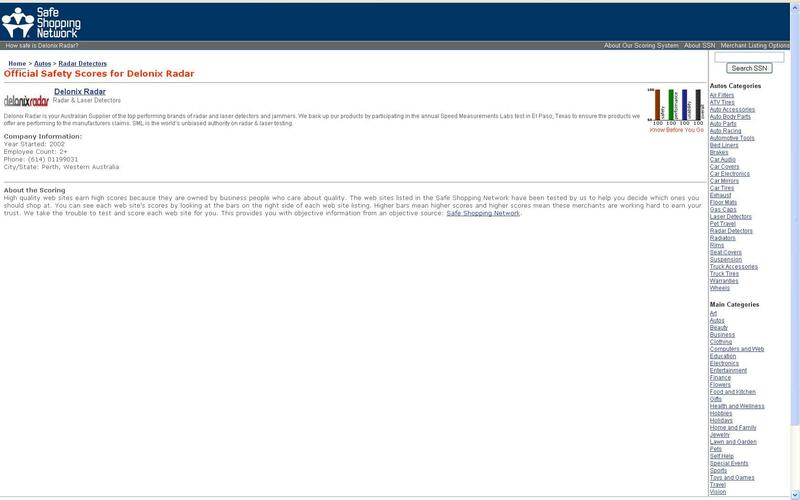 The RAC states a vehicles speedometer is only accurate to within 10% - to take into account tyre wear and other factors. This means at 100km/h your actual speed could quite well be anywhere from 90km/h to 110km/h and be within their accepted limits. But not Multanovas! 104km/h in a 100km/h zone will most likely result in a flash, and a speeding fine in the mail a few weeks later. Saving lives or revenue raising? Two motorists who revealed how mobile speed cameras were unreliable have begun a legal battle to show Victoria's fixed cameras can't be trusted either. John King and Claus Salger say thousands of Victorians are wrongly fined for speeding each year -- caught by fixed cameras that are poorly installed, calibrated and maintained. But they say the millions of dollars in revenue at stake mean police are using every legal mechanism available to deny [them] secret information that will help uncover a public scandal. At Heidelberg Magistrates' Court yesterday, Mr King applied for a subpoena against Victoria Police to obtain a number of speed camera technical documents that, he says, will help him challenge a 2007 fine. He told the court he successfully challenged a speeding fine in his previous case after he and Mr Salger, who acts as his technical expert, gained access to technical manuals through Freedom Of Information rules. Barrister Robert Taylor, for the police, argued the subpoenaed documents would not help Mr King's defence. He said Mr King had not set out to prove his fine was wrong, but that fixed speed cameras were generally unreliable. Above is the most important line of this entire story - where the Police barrister, Mr Robert Taylor specifically states that he was arguing against releasing the documents [they] want because it would prove that all "fixed speed cameras were generally unreliable." Now, the text book definition of "corruption" is trying to hide the truth from the very people that you are sworn to protect. Now, this is EXACTLY what we have been saying all along. People need to eliminate their old flawed belief that speed cameras are generally accurate and every so often get it wrong and understand precisely what the police barrister is saying, which is that these cameras are basically inaccurate and every so often they get it right! The decision on the application will be announced on February 24. In 2007, Mr King and Mr Salger each won battles to overturn mobile speed camera fines. By comparing police photos with images in a technical manual, Mr Salger worked out that his 22-year-old Nissan Patrol had apparently accelerated faster than the space shuttle. Outside court yesterday, the pair said they were battling on behalf of all Victorian drivers. "History shows us that these fixed cameras are notoriously unreliable," Mr King said. He was allegedly caught driving at 66km/h in a 60km/h zone at the corner of Gardenia St and Doncaster Rd, North Balwyn. Redflex Traffic Systems last month agreed to pay US taxpayers $22,000 in order to settle a complaint against the Australian firms illegal use of uncertified radar equipment. The Enforcement Bureau of the Federal Communications Commission (FCC) announced the move on December 23, a day traditionally used to bury controversial decisions while public attention is turned toward celebrating the Christmas holiday. The settlement was designed to punish Redflex while avoiding the staff time involved in pursuing a formal fine that the company would have immediately challenged in court. The National Motorists Association expressed disappointment at the FCCs failure to pursue the matter fully. The Pinal County Sheriff's Office sent out a press release in December with positive news about Hunt Highway crashes: They were cut in half after the photo radar program began. Unfortunately, that wasn't true. Not even close. Crashes actually increased on the road, updated statistics show. And the number of collisions was more than double the figure previously cited by the sheriff's office. Sheriff's spokeswoman Vanessa White said they released the news with preliminary data based on the number of reports in the system at the time. That information was missing dozens of crashes. Hunt Highway is a two-lane artery that serves nearly 50,000 people in the Santan area. The highway, which runs from Queen Creek to Florence, has become a perilous stretch of road in the past few years. In 2007, there were 203 crashes - more than a 650 percent increase since 2003. County officials have worked to improve safety by making road improvements and adjusting speed limits. But the results have been spotty. And the sheriff's office hoped to get a handle on the problem by implementing a photo radar program. On July 9, two radar vans were placed on Hunt Highway. They began issuing citations a month later. Sheriff's officials quickly touted the vans as a success, attributing to them a 53 percent decrease in crashes months after their inception. But there was no decrease, and the drop the sheriff's office cited did not account for 55 crashes. The news release said there were only 40 crashes from July 9 to the end of November, compared with 82 during the same period in 2006. There have been fewer crashes so far in 2008 compared with 2007, records show. But the decrease isn't significant, only 14 fewer crashes through May 21. The number of injury crashes has remained the same. It isn't clear if the downward trend will continue as some months see more than 20 crashes and the summer months have been some of the worst in the past. When crashes occur on Hunt Highway, the road is shut down for hours as there are virtually no routes in and out of the area when it is closed. A deadly crash shut down the highway for 12 hours on May 7, leaving thousands of commuters cut off from schools, businesses and jobs. That crash occurred near Thompson Road, which falls into the most heavily traveled part of the highway - a five-mile section from Ellsworth to Bella Vista roads where more than 100 crashes occurred in 2007. Is it no wonder the public are so anti speed cameras? We are being LIED TO by the authorities that claim speed cameras are saving lives - when all they are doing are collecting more revenue for the government. Speed cameras on the West Gate Bridge have been secretly switched off for two years because they are unreliable. Police have this morning confirmed that two banks of speed cameras launched in 2005 at one of Melbourne’s worst traffic blackspots were turned off just over 12 months later. Assistant Commissioner Key Lay confirmed the secret move, telling 3AW Radio police were forced to act because the cameras were inaccurate. He said the cameras were turned off permanently in September 2006. “We were seeing a lack of clarity and at times we weren’t able to identify the offending drivers,” Assistant Commissioner Lay said. He confirmed there were “quite a number” of motorists booked for speeding, but police also rejected “many, many more”. “Because of the number of rejections ... we simply turned it off,” he said. Speed camera accuracy has been questioned in SA. The South Australian Opposition says an apparent speed camera glitch means hundreds of motorists may have been wrongly fined. An Adelaide man is disputing a speeding fine issued last January based on evidence from a mobile police camera on Main North Road, because of contradictory information about the camera's positioning. The ABC Stateline program has revealed conflicting figures from the police and the SA Police Minister that suggest the camera was in two locations at once. The Opposition's Iain Evans says a mistake has been made has called for any wrong charges to be dropped. "Commonsense says all of the photos taken that day from that camera are likely to be wrong," he said. "They all should be reviewed and, if they are wrong, they all should be withdrawn. "If people have paid fines or lost demerit points, the demerit points should be reinstated and the fines reimbursed." Dozens of speed traps, including new speed cameras on police cars, 88 extra mobile radars and 24 fixed cameras along Perth’s freeways, would be introduced under a State Government road safety blueprint, reaping an estimated $200 million a year from more than two million fines for WA motorists. Details of the plan for a massive increase in the number of infringements issued each year, from about 440,000 to more than two million, is contained in a Government-commissioned report likely to form the basis of the State’s new 12-year road safety strategy. “The expected fine revenue from speeding motorists detected by the recommended speed-enforcement operations, at least in the short term, is estimated to be $204 million per annum,” the 2006 Monash University accident research centre report said. By comparison, last year WA drivers paid $17 million in speed camera fines. As well as 24 fixed cameras on freeways, which would generate an estimated 427,356 fines a year, the report also recommended 43 new vehicle mounted cameras and an extra 88 “mobile radar units”. About 1.1 million fines a year would come from mobile speed cameras and laser detectors on metropolitan roads and 495,000 fines from mobile speed cameras and radar units on rural roads. “Processing of the estimated 2.043 million speeding tickets per year from the recommended package will require a substantial increase in police personnel as well as about $4 million capital investment in the back office infrastructure to triple its offence processing capacity,” the report said. The Office of Road Safety said the report, by Professor Max Cameron, was being reviewed and an update prepared before speed enforcement recommendations were included in the 2008-2020 road safety strategy. But Professor Cameron confirmed yesterday that the updated version “won’t be much of a departure from the package”. It would also include an additional recommendation for point-to-point speed cameras on open roads after the ORS asked him to examine the new technology. “That might mean that some other forms of speed enforcement is not done as much, but probably it won’t be fundamentally different,” he said. Professor Cameron also confirmed there was still no crash-based evaluation of WA’s Multanova program and that the report was based on the effectiveness of speed cameras in the Eastern States and overseas. Police confirmed yesterday they had 19 Multanovas in operation, 191 car-mounted radars, 31 hand-held radars used to check Multanova effectiveness and 290 hand-held lasers. The report said the package would provide an annual saving of $186 million in social costs, with the estimated cost to operate the package less than 10 per cent of the fine income. Independent MP Dan Sullivan said yesterday that motorists should prepare for a speed enforcement strategy that was based on increasing speed cameras and revenue. “This report is conclusive proof that the State Government is more interested in using speed cameras to raise revenue rather than reduce the road toll,” he said. ORS acting executive director Jon Gibson said that the Enhanced Speed Enforcement Steering Committee would use the updated report “together with additional advice and research from Australia and around the world” to form its recommendation to the Government. Police Minister John Kobelke said he expected to receive a draft road safety strategy for consideration midyear. More than 70 per cent of police believe speed and red light cameras are more about revenue-raising than road safety. Only 6 per cent strongly believe the true purpose of the cameras is to cut the road toll. And 42 per cent strongly believe making money for the Government is their main role. The findings are based on the responses of 3459 Victoria Police officers state wide to a landmark Herald Sun survey open to more than 11,000 serving police. Government coffers were boosted by an estimated $147 million through the issuing of 671,063 mobile speed camera fines in the year to October 2007. That figure excludes fines from fixed camera locations such as the CityLink tunnels and the Geelong road. This is ONLY Victoria. Add the other states in Australia and you're up to 1 billion dollars annually. There are an average of more than 50,000 mobile speed camera fines dished out every month in Victoria. EIGHTY-SIX per cent of police want a permanent anti-corruption body with royal commission-type powers to investigate Victorian public servants and politicians, in the same way the Office of Police Integrity investigates police. ONLY 39 per cent of officers think there needs to be an OPI to investigate police corruption -- and 61 per cent want the agency scrapped. NINETY-SEVEN per cent of officers surveyed believe magistrates and judges hand down too many light sentences and do not support the work of the police. ALMOST as many said their job would be a lot easier -- and society a lot safer -- if courts were tougher. But Insp Richard Watkins, of Victoria Police's major collision investigation unit, said traffic police strongly supported speed cameras. "If the cameras are doing their job, then we spend less time at serious collisions and fatalities," he said. "Members might want to come and spend a day with us to see the impact of speed." A Victoria Police spokeswoman said it was disappointing that some police had chosen to claim speed and red light cameras were more about revenue-raising than road safety. "It is these same police who have the responsibility of picking up the pieces and dealing with families when speed leads to an accident or even a fatality," she said. "The traffic camera program is ultimately designed to reduce the number of vehicle collisions and therefore the incidence of road trauma and death," she said. "An independent auditor- general's report in 2006 rejected the common perception that the speed camera program is aimed at revenue-raising," she said. Perhaps the auditor general's report was not so independent. All polls done show regardless of the demographics, the majority believe speed cameras are aimed at revenue raising. "It suggested speed enforcement initiatives are primarily directed at reducing road trauma, rather than raising revenue. "The road toll has been reduced by about 50 per cent since the inception of cameras in 1989. Really? Can you prove this? How about safer cars, better roads, faster emergency workers, less km travelled by motorists during the depression of the early 90's. Local police choose where mobile cameras are placed, taking into account the number of crashes. "This is so the cameras can be situated where there is a direct correlation with road safety," she said. "Further to this, excessive or inappropriate speed was identified as a contributing factor in 111 fatalities -- 33 per cent of the road toll -- in 2007, based on the preliminary assessment made by police at the crash scene. "excessive or inappropriate speed was identified as a contributing factor"
This is one of the deceptions used to cover speed cameras as safety devices. Firstly note the use of the words "excessive" or "inappropriate" speed. It doesn't say driving over the posted speed limit. And it doesn't say driving 3km/h over the posted speed limit. If a motorist was travelling (under) the posted speed limit, but (the speed) was too fast for the conditions at the time (traffic / weather etc) then the accident is written up as "driving too fast for the conditions". "I was Manager Road safety research at VicRoads from 1990 - 1994 and I am an expert in speed, speeding and crashes. I have highlighted in yellow the speed related factors, and the distraction related factors. Note that on average there are around 1.75 factors recorded per crash. Interestingly excellent USA research has shown that distraction is probably a factor in 65% or more of crashes - yet GB police only identify it as a factor in 2% of all crashes! Rarely is one factor in it's own a cause for a traffic accident. As stated by John Lambert above, the average number of factors is 1.75 per crash. In other words on average, there are almost two equally contributing factors to every crash. This being so, why are these other factors not being addressed as vigilantly as speeding? Well the answer is simple. It costs money to make roads safer, fix dangerous black spots and improve pedestrian safety. Rather than spend money on fixing a problem, just wack up a speed cameras, and collect money! THE state's most senior traffic police officer has rejected Opposition claims that speed cameras and breath testing systems have failed to meet national accreditation standards for the past four years. Opposition police spokesman David Ridgeway and transport spokesman Duncan McFetridge yesterday revealed that the accreditation for some equipment used by South Australian police had been suspended by the National Association of Testing Authorities in 2004. "Radar equipment, laser guns and breath analysis used by SA Police were included in the suspension, so we don't know how accurate that equipment is," Dr McFetridge said. "The police, 3 1/2 years ago, had their accreditation suspended and that raises some serious questions about all of the speeding fines and the breath analysis readings. "It's a very serious issue when the Government is levying fines through the courts at many millions of dollars. Can we be certain about the accuracy of this detection equipment?" But Superintendent Tony Rankine, the officer in charge of the Traffic Support Branch, said police had voluntarily suspended membership from NATA when the calibration facility moved from Sturt to the Netley Police complex. "SAPOL strongly refutes any claims at all that our breath analysis equipment or our speed detection equipment are inaccurate and would not withstand the closest scrutiny," he said. "When we relocated from the Sturt complex to the Netley complex starting in 2004, we thought that it wasn't fit and proper to remain on the accreditation in exchange of those venues. "All the time when we were suspended by an endorsing body . . . we complied with Australian standards and we also complied with federal legislation." Police Minister Paul Holloway said it was irresponsible of the Opposition to raise the issue without checking the facts. "We know they have grossly distorted the situation with NATA, but the point is police do regular testing of their speed detection devices and none of the random breath testing devices or the speeding devices have failed to meet national standards," he said. "What disappoints me is that they are really barracking for the hoons." One Nation will make a national call to abolish 99 per cent of speed detection devices. It is about time road safety became paramount rather than all efforts of our police force working towards revenue raising. The public are not aware that it has been proven that a majority of speed detection devices are illegal and in fact by their use, detrimental to public and road safety. In fact these devices do not comply with appropriate legislation. We must question why it is when we receive a fine we are considered guilty. What has happened to the common law right of innocent until proven guilty? Or is it the case that the police cannot prove your guilt? A perfect example is when we look at the police operator's manual. For instance section 5.5 of the mobile radar manual states: "there are many forms of interference. However, they are too numerous to mention". So where is their accuracy? Let us imagine they are within 10 per cent of their readings (although this has not been proven). We are still in big trouble in regards to road safety. Most countries have adopted speed limits that adhere to the 85 percentile, which sets limits at the safest level to reduce road accidents. For over a decade our government has even ignored this practice. The NMAA (National Motorist Association of Australia) has lobbied for this and other road safety initiatives, all falling on deaf ears. Nearly $300million has been raised from South Australian motorists in revenue while road fatalities remain the same. Never stand in the way of a politician with a huge bucket of cash. When we drove 1950s and 1960s model cars the speed limits were basically 60, 80 and 110. Now we drive vehicles with much better handling and braking, ABS etc., and our limits have not only been lowered but are becoming increasingly confusing, 40, 50, 60, 70, 80, 90, 100 and 110. In fact, on one stretch of road the limit can change four or five times and where do they hide the cameras, on downhill slopes and in bushes etc. Our government would have you believe speeding is the only cause of road crashes. Out of 40,000 crashes-per-year in SA, 218 are from excessive speed (1.2 per cent), 5266 by failing to give way and 17,379 from inattention. What has our government done to address inattention? A higher police presence on the roads and better driver education are ignored, all in favour of hiding our police in the bushes. And it is all getting worse. They have now reduced the allowance between posted limits and fine allocation, creating a situation where, when you allow for the inaccuracy of both the vehicle's speedo and the detection device, motorists can be fined for actually adhering to the limit. Where is the fair go here? Should we be concentrating on our speedo or on the road ahead? Considering the facts, there should be at least a 15 per cent allowance. Detection devices should be highly visible and located at known black spots and our police should be on the roads promoting road safety rather than revenue raising. Australian drivers should be congratulated rather than penalised. Even with the odds stacked against them there has been a 50 per cent reduction in fines issued last year. But, this has created more problems. This shortfall in government budget forecasts has prompted our deputy police commissioner Grant Stevens to demand our police issue a minimum of a 20 per cent increase in fines issued. In my mind, this equates to extortion of innocent drivers without regard to road safety. My advice is to give the buggers nothing. Drive 5kph below posted limits, keep an eye on your speedo and let other drivers know where they are, until we can address this issue and if you think you have been fined for doing the right thing, stand and fight in the courts. It is about time all Aussie motorists stood against this blatant attack on their rights. Even the insurance companies are capitalising on this situation by refusing claims, in some cases, if you have not advised them of any traffic offences within 14 days of receiving them, even minor speeding fines that might not even have been fair. The worst fact of all is that most of our road laws have never been endorsed by our government to enable them to become law. Even the detection devices themselves do not meet legal metrology standards. These are just a few problems raising their ugly heads from this situation. One Nation will fight for motorists' rights for a fair go and for our country's long term road safety. AFTER learning his Nissan Patrol could supposedly accelerate faster than the space shuttle, Claus Salger began to doubt the accuracy of mobile speed cameras. The retired engineer had been fined for doing 59km/h in a 50km/h zone near his Westmeadows home. He knew he wasn't speeding but had no proof. It was only after obtaining a copy of a Tenix speed camera manual through FoI that his defence became obvious. By comparing police photograph of his 22-year-old 4WD with images in the manual and doing some simple calculations he worked out the speed. "I had to have accelerated at 15,000km/h for my vehicle to be in the position it was photographed," Mr Salger said. After successfully contesting his case, Mr Salger was asked by businessman John King to appear as an expert witness for his own speeding fine. The pair realised early on it was almost impossible to beat a prosecution, which is why so few cases get to court. So they used methods normally employed by the prosecution against any motorist brave enough to risk $5000 in legal costs to challenge an infringement notice. The pair have studied the technical manuals of the cameras, obtained various operations and verifications manuals and Tenix's contract. Their biggest triumph was getting a 20-minute look at a verifications manual. That document details how speed camera images are interpreted. The magistrate in Mr King's court case ordered it to be produced but would not let them keep a copy. When Mr Salger tried to get a copy through Freedom of Information laws, Victoria Police said it no longer existed. The men beat their speeding fines using the speed camera operator's manual, carried by each Tenix employee when they set up a roadside camera. It contains four photos, two each for vehicles snapped in the forward and away modes. Two of the photos show the correct position of a vehicle and have ticks and two show vehicles in the incorrect position with crosses next to them. In the away mode the manual says a vehicle should have just left the beam to be speeding and in the forward mode should have just entered it. A driver can calculate if they were speeding by using the photograph supplied by the Victoria Police Traffic Camera Office and an acetate overlay. Mr King and Mr Salger said drivers could determine the width of the beam by drawing two parallel vertical lines on the acetate, one 61 per cent from the left of the image and one 82 per cent from the left. The space between the two lines is the radar beam width. Drivers can then calculate if their vehicle is in the correct position by putting the overlay over the photograph. The accuracy of mobile speed cameras is under assault by the legal world. Two Melbourne drivers have beaten speeding fines by challenging camera images in court, and more are set to follow. 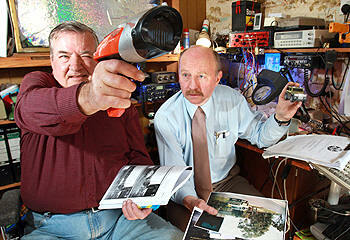 John King and Claus won David-and-Goliath battles against Victoria Police by using information contained in a speed camera operator's manual. Illustrations in the manual, obtained through Freedom of Information, proved they could not have been speeding. 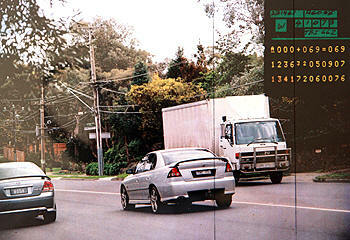 In November, a Melbourne court will hear a challenge to a speed camera fine on the same basis. Barrister and traffic law expert Sean Hardy will call two experts in the Melbourne Magistrates' Court on behalf of a client who says he was not speeding. Mr Hardy said Mr King and Mr Salger had exposed systemic problems in mobile speed cameras and the case would test if their success could be repeated. "I don't think John and Claus have blown the system apart," Mr Hardy said. "But I think they've exposed cracks in it. And people have been exposing cracks in it for a long time." Mr King and Mr Salger won court costs from Victoria Police in separate prosecutions and say their cases reveal a culture of secrecy, misinformation, cover-up and sloppy prosecution. They said the system of verifying images was flawed and biased against drivers. The men claim the system is so complex and secretive most drivers cannot challenge their fines. "Most people aren't going to spend three days in court fighting a $160 fine," Mr King said. "I was able to win my case using their own operator's manual. It showed the camera didn't produce an accurate image in my case." Mr Salger, who has 45 years experience in radio electronics and worked for 16 years at Melbourne airport, picked apart the camera manuals and studied the complex radar science that defeats most drivers. Tests proved that radar-activated cameras can be triggered by street signs, road barriers and even the movements of car aerials, he said. "As the system stands now you don't have to have committed an offence to be guilty of it," Mr Salger said. "The camera does not point and say, 'this car did it, or this one did not, or none of them did it'. It takes a picture. "And then that picture has to be interpreted. The flaw I see is in the interpretation. Under Victoria's speed camera legislation police normally only have to prove the camera was properly set up and calibrated in order to obtain a conviction. A UK company has won the contract to operate Victoria's controversial speed cameras after a string of costly blunders by previous service provider Tenix. Serco would take over management of traffic camera services from Tenix at the end of October, Victorian Police Minister Bob Cameron announced today. Although dumped from operating the cameras, Tenix - which came under fire in June last year after it wrongly issued more than 1,100 speeding tickets - will retain the contract to issue and enforce infringement notices. Following last year's bungle, the company was hit with a six-figure fine and the following month was forced to withdraw a further 72 speeding fines after another embarrassing processing error. Serco - which will be responsible for installing and maintaining digital speed and red light cameras - has been warned it faces fines of up to $50,000 for each wrongly set up camera that leads to speeding fines issued in error. Mr Cameron said the government had learnt from experience over bungled speeding notices, adding that the penalties clause had specifically been built into the new contract. "There will always be human error in any system," Mr Cameron told reporters. "We want to make sure that there is more attention in the system and that's why part of this contract there are penalties of up to $50,000 as a consequence of any human error." The speed cameras have been a thorny issue for the government and motorists alike, ever since Tenix and US firm Lockheed Martin jointly won the $460 million tender to operate the network. In recent years, the system has been hit by faulty cameras, wrongly-issued speeding fines. The government, on several occasions, has denied claims the cameras were just revenue-raisers. But figures released in June 2003 showed the state was collecting $260 in speeding fines every minute. That figure amounted to $33.5 million in the first three months of the year and a 66 per cent increase compared to the same period a year before when speed cameras raised $20.1 million. In 2004, the government promised to pay tens of thousands of motorists $19.7 million in refunds and compensation as a result of faulty speed cameras. Community and Public Sector Union (CPSU) Victorian secretary Karen Batt called on the government to release more details about the $150 million tender to reassure the public that price was not the only determining factor in awarding the contract to Serco. "Safety and not the bottom line must be the first priority for Serco under their new contract to operate traffic camera services," she said. Today, the government and Victoria Police were keen to highlight the role traffic cameras play in reducing speeding and cutting the state's road toll, saying the percentage of motorists caught speeding had dropped from 24 per cent to just two per cent since cameras were first introduced in Victoria in 1989. "Victoria Police will continue to use cameras as an integral part of practices in order to reduce speed right across the state. 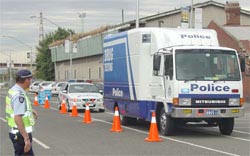 Reduction of speed is a good thing, it's one of the key killers on our roads," Assistant Commissioner Noel Ashby said. "Red light cameras have also proven highly successful, not only in reducing speed through intersections but stopping people running red lights and reducing crashes in that context. "Victoria Police will continue to assess high risk locations and continue unapologetically to target the areas particularly where road trauma is likely to happen or has occurred previously. which offers a magnified view of the scene, which is displayed by the traffic officer on a large 7" colour LCD. Images can be paused into solid stills for identification and printing. The system can be deployed on a portable stand placed covertly on the roadside, or inside the rear of small vans. This video traffic speed camera system can capture a speeding vehicle from distances of up to l km and can distinguish a number plate from the distance of 150 meters or more. The recorded mpeg4 video on a hard drive recorder; can be immediately reviewed as video or still shots to recall specific events allowing an irrefutable record of the speeding offence. Laser sensor for video traffic speed camera systems is suggested for dense traffic applications as it applies a pencil sharp laser beam to measure vehicle speeds to pick up a specific vehicle even in dense 6-lane traffic. A radar sensor is simpler to use, and is ideal for highways/motorways with traffic regularity of less than 10 vehicles per minute. As many as 100 North Coast motorists may have been ripped off and forced to cop thousands of dollars in speeding fines because of a dodgy speed camera. Motorists believe the speed camera at the bottom of St Helena Hill could be over-reading by as much as 15 kilometres per hour. The RTA has been called on to test the accuracy of the camera, and if a flaw is found angry motorists will demand their fines be waived and the points on their licences reinstated. The possibility of a class action civil matter is also being discussed by some drivers. One affected resident is disability support worker Faye Livock, of Ocean Shores. the spokesperson said. All camera speed measurement systems in NSW are fail safe  they shut down rather than take an incorrect reading. n If youve received a ticket from the St Helena Hill camera and are concerned, contact Mr Fidler on 6684 7535. Victorian police blame human error, **cough** not the state's fixed speed cameras, for a fine wrongly issued to a bus driver on the Hume Highway near Melbourne. The driver from Seymour Coaches, at Seymour, in central Victoria, was issued with the $250 fine after Victoria Police alleged he was detected doing 123km/h in a 110km/h zone on the Hume Freeway at Craigieburn, north of Melbourne, in April. Buses are restricted to 100km/h on Victoria's roads, even in 110km/h zones. Two years ago, 100 drivers were wrongly booked for speeding at Somerton, in Melbourne's north, because of an incorrectly set camera. And in 2003, all fixed speed cameras on the Western Ring Road, CityLink tunnels and Monash Freeway were tested and fines suspended after readings on three units were deemed to be questionable. Seymour Coaches managing director Peter Louchnan said it was not possible for the bus to do 123km/h because it was fitted with a speed limiter. "The vehicle is speed limited to 100km/h from the factory," Mr Louchnan told Southern Cross Broadcasting. "Once it hits that 100km/h on the speedometer the accelerator is flat (on the floor), it won't do any more." Mr Louchnan said the speed limiter had not been tampered with and was regularly checked by government inspectors, the last time at Christmas. But Victoria Police said human error was to blame, **cough, cough** and not a fault with the camera. "It is not a technical systems fault, it is an error in human verification," Superintendent Shane Patton said. "My staff member here hasn't done their job properly, hasn't checked the images properly." "It's totally unacceptable what has occurred." Supt Patton said the bus had been photographed at four fixed speed camera check points on the freeway. He said the error occurred because another bus from Seymour Coaches with a similar number plate was travelling in the same direction on that stretch of the freeway at the same time. "On this occasion what has happened is that there are two different vehicles with virtually identical number plates from the same company. "That should have been picked up by the verifier." Victoria Police has now withdrawn the fine. Seymour coaches said it was satisfied with the outcome, but the bus driver "Warren" said he had no faith in the speed camera system. "There are lots of number plates out there that are similar," Warren said. "What's going to happen? Are these people going to get booked and have to resort to taking it to court before something is done about it." More speed cameras are to be set up in Canberra. Red light and speed cameras will be installed at the intersection of Canberra Avenue and Captain Cook Crescent; and at the intersection of Gungahlin Drive and Gundaroo Drive. Speed cameras will also be installed on a number of sites on the Tuggeranong Parkway and the Federal, Barton and Monaro Highways. The cameras are expected to be operating by the middle of the year. Speed Camera shy ACT highways get fixed 15/4/07 source: canberra.yourguide.com.au The number of fixed speed cameras on ACT roads is to almost double from July. The extra cameras will be placed on some of Canberra's busiest roads and the number of fines is likely to soar from the current 38,000 a year. For the first time, permanent speed cameras will be placed on stretches of the city's main highways. The Federal, Barton and Monaro highways will be targeted, along with the Tuggeranong Parkway. 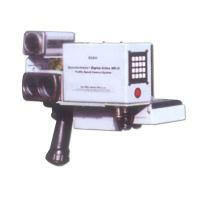 The "super-cameras", which cost up to $250,000 each, will be concealed under the road or in cabinets by the roadside. There are currently 11 fixed speed cameras in the ACT. That will increase to 19 in July. Transport Minister John Hargreaves was unapologetic about the proliferation of speed cameras yesterday, saying they would save lives by discouraging dangerous driving. But Liberal transport spokeswoman Vicki Dunne slammed the new fixed-camera scheme as a revenue-raiser. "It's entirely about revenue, dressed up as if it's about road safety," Mrs Dunne said. "These [new camera sites] are not recognised black spots, they are not particularly dangerous." She said motorists would be caught for unwittingly nudging over the speed limit while driving along a safe, straight stretch of road. If there were to be extra cameras, they should be placed at intersections where there was a risk of collisions. "They should be in black spots, they should be where people get hurt." She urged Mr Hargreaves to detail exactly why these sites had been chosen for the extra cameras, and to issue crash statistics pointing to hot spots. A spokeswoman for Mr Hargreaves said speeding was a major safety issue on Canberra's roads and speed cameras were a proven deterrent. She said moving fixed speed cameras out on to the open road, instead of confining them to intersections, was about "widening the scope of the [road safety] project". "The best thing people can do to avoid being fined is not to speed," she said. Executive member of the ACT chapter of the Australasian College of Road Safety, Robin Anderson, defended the location of the new cameras. He said placing them on busy arterial roads where people were travelling at speed was wise. "There is a great value in having the cameras on major roads ... it's a positive for road safety," Mr Anderson said. He said the ACT had strict criteria about where speed cameras could be placed to maximise the safety returns. "It's never **cough** been about revenue raising." Studies had shown installing a speed camera would cut crashes in that area by up to 40 per cent. Manager of Road Safety for the Municipal Services department, David Quinlan, said the location of the new fixed cameras was determined by looking at data on speeding. Installing semi-permanent cameras in these areas would free up the speed camera vans to focus on other areas, including residential areas. Currently, the ACT's 11 fixed cameras are all red light/speed cameras located at intersections. The only speed cameras away from intersections are radar or laser cameras which operate from vans or are hand-held by police. From July this will change and fixed cameras will be located along highways for the first time. Eight extra fixed cameras will be installed. Two will be red light/speed cameras at intersections, and six will be speed-only cameras located along highways. Some of these will be permanent underground cameras, known as "loop detector" cameras, which are embedded in the road's surface. Others will be semi-permanent radar cameras operating from stand-alone roadside cabinets. The ACT also has five mobile speed cameras which operate from vans at 120 authorised sites. Smile for the speed camera 14/5/07 source: blacktownsun.com.au A new school zone speed camera is operational on Fitzwilliam Road, Toongabbie, in front of Toongabbie Public School. An RTA spokespreson said the new speed camera would help slow down motorists in the hours before and after school. "There is no excuse for speeding in a school zone," the spokesperson said. "An independent report into the effectiveness of fixed speed cameras in 2005 revealed that cameras dramatically improve road safety. "The report found that fatal crashes are reduced by 90 per cent and injury crashes by 20 per cent at sites where speed cameras are installed." The new camera will cover both directions and will operate 24 hours a day, seven days a week. 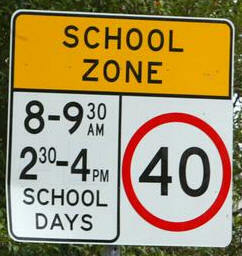 "They will enforce the 40kmh school zone limit during school zone times, from 8 to 9.30am and 2.30 to 4pm."